How Can You Benefit from a Homemaker? Is someone taking care of you today? Is someone doing light housekeeping for your home? If not, then you should hire a homemaker today! If your illness or disease keeps you from doing the chores, this is where a homemaker steps in. They will help you do household chores such as vacuuming, dusting the furniture, changing the bedsheets, doing the laundry, and more. These chores should be done every day in order to improve your ease of living. If you suffer from diseases such as dementia or Alzheimer’s disease, most of the time you’ll forget to take your medicines since there’s no one there to remind you with your medication. These medicines should not be skipped, especially if those medicines are important to improve your condition. If you don’t want to skip another medication, hire us as your homemaker. If you need help preparing meals for breakfast, lunch, or dinner, all you need to do is to hire us as your homemaker. We make sure to cook nutritious and delicious food for you everyday. Of course, we will take note of the food that you shouldn’t eat for your safety. That is why we’re working closely with your nursing aides or nutritionists for advice. Whenever you need an In Home Elderly Care Assistance in Southeast Michigan, you can always contact Heaven Sent Home Support Services for help. 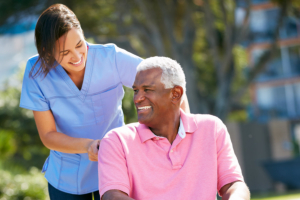 We provide focused and holistic Home Care Services in Oakland Counties, Michigan. If you want to hire our homemakers today, reach us at 248-262-7111 or visit us at 25625 Southfield Rd., Ste. 208, Southfield, MI 48076. We are ready and happy to help you!